“Double, double toil and trouble; Fire burn, and caldron bubble.” -William Shakespeare’s Macbeth. The quote above definitely has Cauldron: Bubble & Boil from Magic Circle Games in mind. In Cauldron: Bubble & Boil players will take on the role of a witch. During game play players will collect resources from gardens that they grow, cast hexes on themselves or other players, & brew recipes. You may be asking how this work? Well, I can tell you that it is all about the magic of this game. At the beginning of the game players will receive a cauldron, one cube of each color, five recipe cards & a Diablerie Track. The Diablerie Track will keep track of how many times that player has been mischievous & will have the turn order description on it. 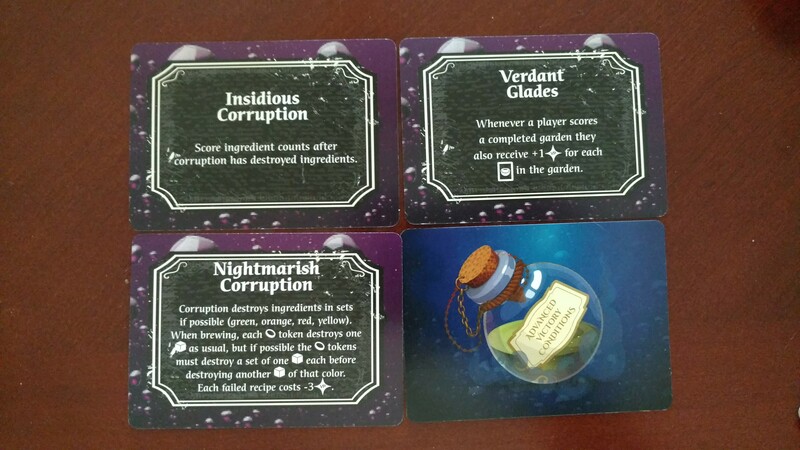 Each turn players will follow a list of five actions: hex, harvest, plant, collect a recipe, & discard/draw. The recipe cards are pretty unique. They will end up having multiple uses during the game. One use will be to cast a spell or hex. Players will also be able to plant multiple recipe cards to make a garden. And the usage will be to place face-down under the cauldron to brew at the end of the game. On a player’s turn they will be able to cast a hex. This will either affect themselves or another player. Sometimes this is good but most times a hex will be bad. Casting a hex will usually move a player’s level up on the Diablerie Track. 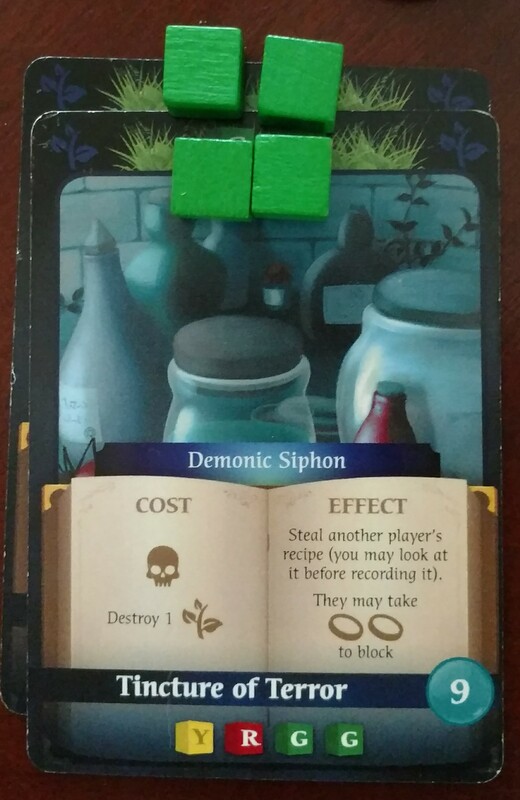 Hexes will also cause players to sometimes receive corruption tokens. Next a player will harvest resources from the cards in their garden. These resources will move into their cauldron. These resources will be used throughout the entire game. Plus a player can not look in their cauldron. This will be important. Although it is hard to memorize what is in the cauldron, it is still possible. The third thing a player will do is the plant a garden. A player is only allowed to have two gardens at a time. A garden is created when a player places two or more cards with the same resources listed at the top. If multiple resources are on a card, that player must pick one. An equal amount of resource cubes will be placed on each card for each of that resource. Garden can be used for multiple things. Gardens will be able to be sacrificed to create hexes or they can be destroyed due to being hexed. 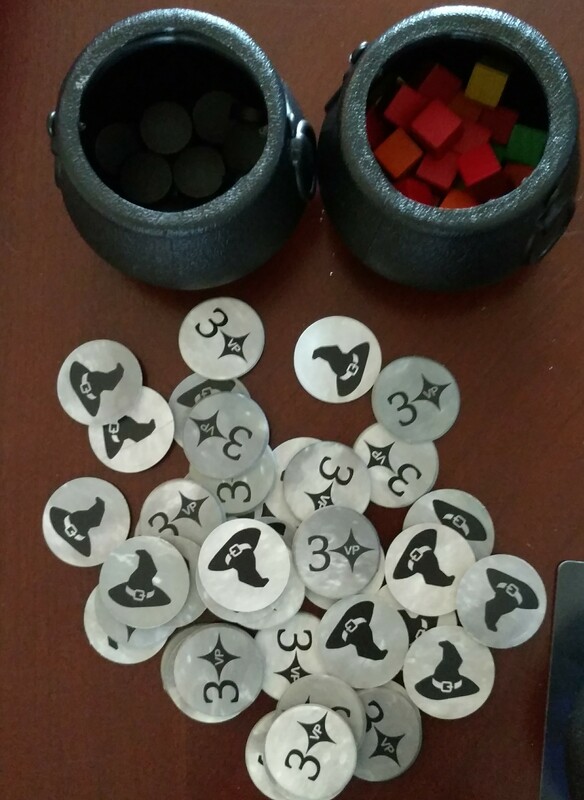 When a player uses up all the resources in a garden they will receive a crone token, which is worth three points in scoring. Also if a player wants to plant another garden while two are out, then they must sacrifice one. This will cause the loss of a crone token. The fourth thing a player will do is to keep a recipe. Recipe resources are found at the bottom of the card. At the end of the game players will ultimately want to make sure that they have enough resources in their cauldron to brew the recipes they have under their cauldron. The last thing a player will do in a turn is to draw up to a hand of five cards. There is no limit on hand size. During this time that player may also discard any number of cards in their hand. This will help root out the cards they don’t want or need. 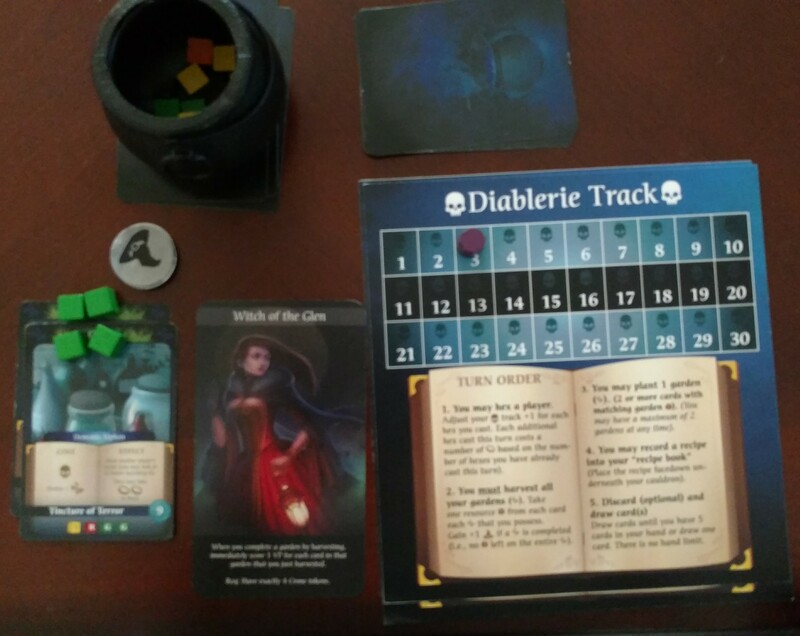 The game ends when two resources are used up, when a player is able to store their seventh recipe card, when corruption tokens are gone, when crone tokens are gone, or when a player is able to move up to spot thirty on their Diablerie Track. 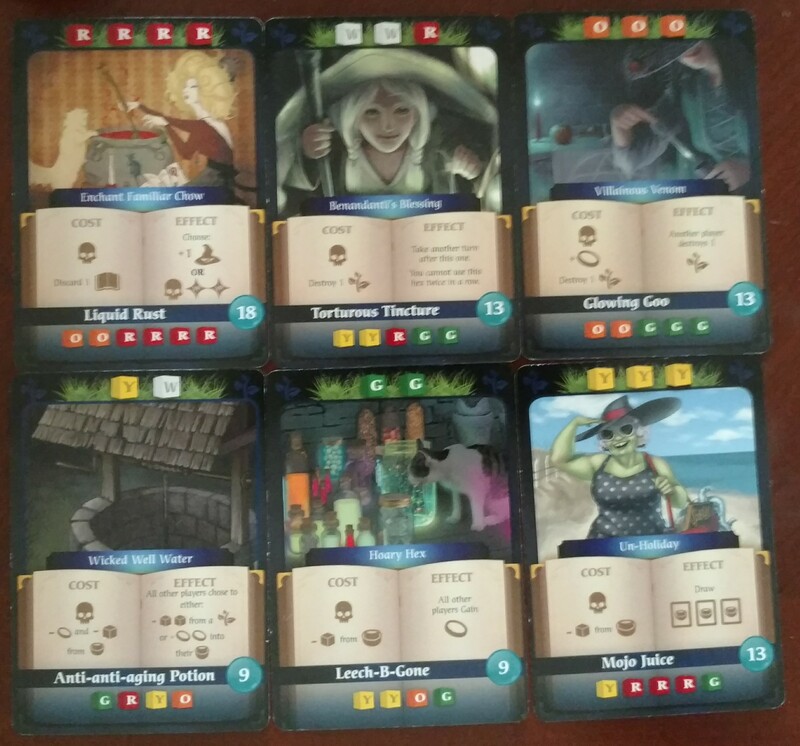 Now scoring in Cauldron: Bubble & Boil is rather Feld-esque. Which I really like. During the scoring phase players will score one victory point for each rank they are on their Diablerie Track. Bonus points will go to those who are ranked the highest or the lowest. Each crone token is worth three points. Then players will also score for the highest & the most corruption tokens. And the player or players with the most of each resource will gain points. So that is the start of the point salad. Next players will begin to brew the recipes they have saved. For each corruption token a player has, they will eliminate a resource cube. This could end up going badly so watch the amount of corruption. Oh yeah, corruption ends up in the cauldron so no peeking. For the resources that are left, players should allocate them to the potions that can be brewed. At this point only potions that are fully brewed will be scored. Extra resources & the like are worth nothing. 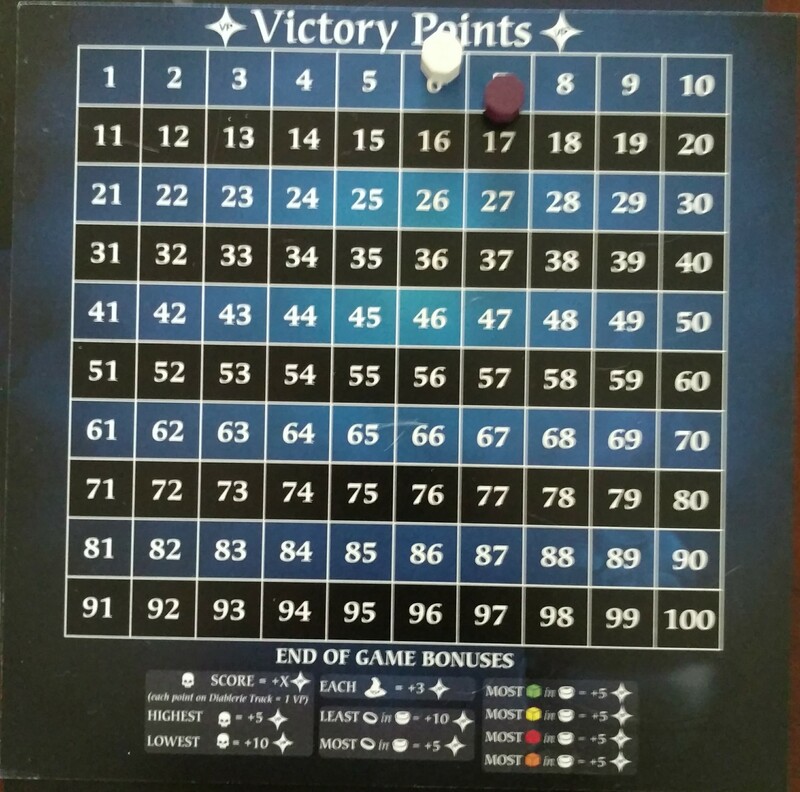 Finally, the player will the most victory points wins the game. A few additional things to add. Included with the prototype I received were a few expansions. One of such is Advanced Scoring cards. These cards will be a stretch goal. These cards will focus on additional scoring. Some of this will happen during the game & some will happen during finally scoring. 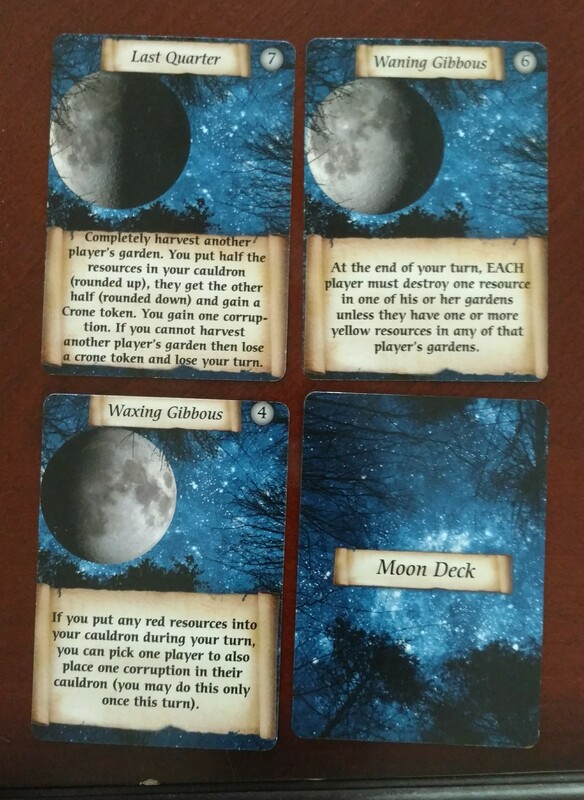 The Moon deck that was included will be a Kickstarter exclusive stretch goal. These cards will be played in different variations of the game. I used the normal variant which will only use on Moon card per game. Other variants will have a player drawing one during their turn. These cards can definitely change the course of the game depending on which is drawn. The Moon can be a very wicked mistress. This was definitely my type of game! Since I am a Stefan Feld fan, Cauldron: Bubble & Boil was able to scratch all of those itches. That is definitely a good thing. Cauldron: Bubble & Boil will be available here: Cauldron: Bubble & Boil. It’ll be available on Kickstarter until August 25th, 2017. Let’s get ready to cast some hexes & brew some potions & of course game on! Previous Previous post: Star Trek Attack Wing Revival?